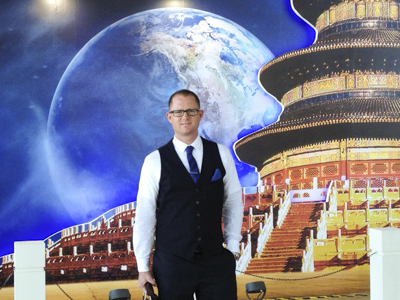 Montana State University student Andrew Crawford was in Beijing last month, where he debated fellow would-be space pioneers over the next destination human kind should explore in the solar system. Crawford argued for the Saturn moon Enceladus, while others favored other destinations, such as the moon, Mars or an interstellar asteroid. When Montana State University engineering student Andrew Crawford says he would like to take the world along on a voyage to land human beings on the ice-encrusted Saturn moon Enceladus, he’s not kidding. There is an ever-present sense of awe and enthusiasm when Crawford talks about space exploration in general. Since he started college, the topic comes up often in his day-to-day life – Crawford has landed three summer internships with NASA, has worked with MSU’s CubeSat research satellite projects and is now on the MSU Lunabotics team, which will compete in a simulated Mars mining competition at NASA’s Kennedy Space Center in May. In an application video to the IAC, Crawford beams as he talks about the possibilities for exploration on Enceladus, and he includes a video chat with then-Antarctica-based doctoral student Trista Vick-Majors, who was part of the team that found living organisms in sub-glacial Lake Whillans. Crawford took his passion to the Harvard-style debate over possible next destinations at the center of the international panel’s Beijing activities. A Harvard-style debate is decided by how much each debater has shifted the initial impressions of an audience to a topic. Crawford admitted that his Beijing audience offered a cool initial reaction to exploring Enceladus, where average surface temperatures hover around minus-300 degrees Fahrenheit, according to measurements from NASA’s Cassini space probe. His pitch was based on Cassini’s findings: All that ice is evidence of water, and many believe that liquid oceans may lurk underneath the ice sheets; and the additional presence of organic compounds could make Enceladus the most likely candidate as a life-sustaining place in our solar system. By the time he’d finished his short presentation, during which Crawford said he again mentioned MSU’s significant contribution to a U.S. team’s groundbreaking discoveries of life in sub-glacial Lake Whillans, the audience’s opinion had significantly warmed toward favoring Enceladus. In the end, Crawford took second place among a group that included representatives from South Africa, Japan, France and China, in addition to a second representative from the U.S.
Crawford’s week in China included a welcome to the IAC from Chinese Vice President Li Yuanchao, listening in on various panel discussions about the future of space exploration, meeting Buzz Aldrin and joining his international cohort on a trip to the Great Wall and walks through the heart of Beijing and the Forbidden City. Crawford said he also was treated to a group lunch with NASA Administrator Charles Bolden. Crawford said the retired Marine major general and former NASA astronaut offered encouraging words to an up-and-coming generation of space pioneers who are aware of ongoing cuts to NASA funding. Crawford’s goal wasn’t always to rocket off to icy Enceladus. With the same passion he now has for space exploration, Crawford became somewhat famous as a professional snowboarder, rocketing off of mountain cliffs on his snowboard. In the Flathead Valley, Crawford grew up focused on playing the violin and becoming a classical musician. As a teenager he switched gears to become a professional snowboarder, competed in World Cup and several Winter X-Games, has his own character in two video games on X-Box and PlayStation and is a veteran of the Warren Miller Films and Entertainment franchise from the early 2000s. Crawford said his turn toward a career in the aerospace industry combines the mathematical meticulousness required of music with the love of boundary pushing and gear tinkering that is quintessential to being a top mountain athlete. His parents and others who know him were not surprised when he hung up his signature Rossignol-designed snowboard to start classes at Flathead Valley Community College, Crawford said. For his part, Crawford says he’s not overly worried about the dangers posed by the long trip to Enceladus – NASA’s Cassini spacecraft required seven years to reach its orbit around Saturn in 2004, where it continues to study Triton and Enceladus, among others of Saturn’s 62 moons. Cassini discoveries at Enceladus – a gargantuan vapor plume and shifting “tiger stripes” along the icy surface at the moon’s south pole – suggest to Crawford and many others that a liquid ocean sits beneath the snow and ice. It also turns out that the saline water vapor plume that blasts beyond Enceladus’ atmosphere becomes Saturn’s faint E-ring. The questions of how such a mission will overcome the engineering challenges inherent in landing astronauts on the surface of the frozen moon are addressed every day in places like NASA’s Jet Propulsion Laboratory, where Crawford completed two summer internships (and continues to contribute by authoring a blog for the JPL intern community). Crawford said they are the kind of questions that pushed him toward junior college, where FVCC professor Effat Rady got him hooked on engineering. Now MSU, where he has benefited from the Montana Space Grant Consortium and small satellite projects at MSU’s Space Science and Engineering Laboratory, is providing building blocks for a career with NASA, Crawford said. Brett Gunnink, dean of the college of Engineering, said it is a credit to MSU that Crawford can put his enthusiasm for NASA to the test.